The apartments have a very good location (near Iraklion airport; right at the beach). 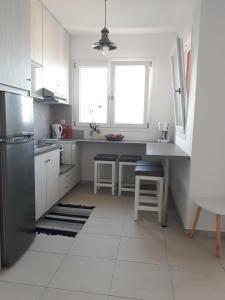 They are comfortable and have a good access (location) to Amoudara and Iraklion. 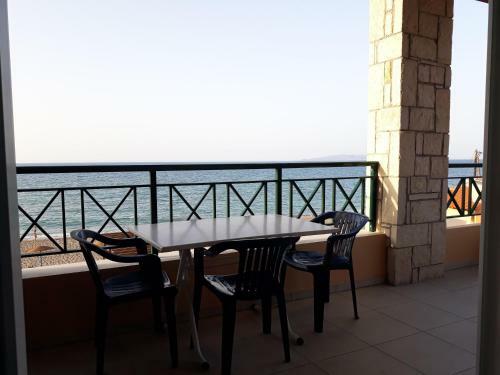 The rooms are clean, have all necessary kitchen equipment (but the tea pot which is not popular in Greece) and they are quiet (if you face the sea you hear just the sound of waves mostly). There is a barbeque, parking place, etc. And the most valuable thing was the attitude of the owners to the guest. They treat them as friends/family and this adds priceless value to your stay. I heard that many guests have been visiting the apartments every year and this is the best type of the review (comment) about this place. Me and my wife became fond of the owners and the place and hope to come back some other day. the courtyard with free sunbeds and an umbrella. 5m away from the beach. Great location. Beautiful views! Great beach but a little rough water and windy. Everything is perfect. Definetly the best of the best. Strongly recommand. The location is perfect. You are on the beach and can even hear the waves at night. There is bus stop to take you to airport (1) and to center (6) just 3 min walk from the apartement. There are beach bars shops supermakets and clubs just next to it. At night it is very calm but just few minutes away you can find beach bars and night life.The room is very clean. The owners are very nice and helpful. You can use the apartment's beach umberalls for free or the beach bars umberallas if you order anything to eat or drink. Location was right on the beach, however the surrounding area wasn't that beautiful. Beach bar next door was very good. Hosts were excellent and helpful! The building has a great garden and direct access to the beach, with beach umbrellas and sunbeds that the guests can freely use. The apartment was fully equipped and close to shops and restaurants in Amoudara. Great location and great sea view! The hosts were wonderful with great Greek hospitality, the gardens were lovely and we were right on the beach! Beautiful apartment overlooking the beach. Hosts very helpful and not intrusive. Truly relaxing holiday. The apartment has everything you need for a self catering stay or close to all restaurants should you choose to eat out. The hostess was very friendly. She changed us a better room which like a loft that was very big and with sea view. The room was clean, less 1 min to the beach. Highly recommend. Hosts were excellent and accommodation was close to where we wanted to be.. Lock in a great price for Minoica Beach Apartments – rated 9.2 by recent guests! Located right across from the sandy beach of Ammoudara, Minoica Beach Apartments features a garden with a sun terrace. 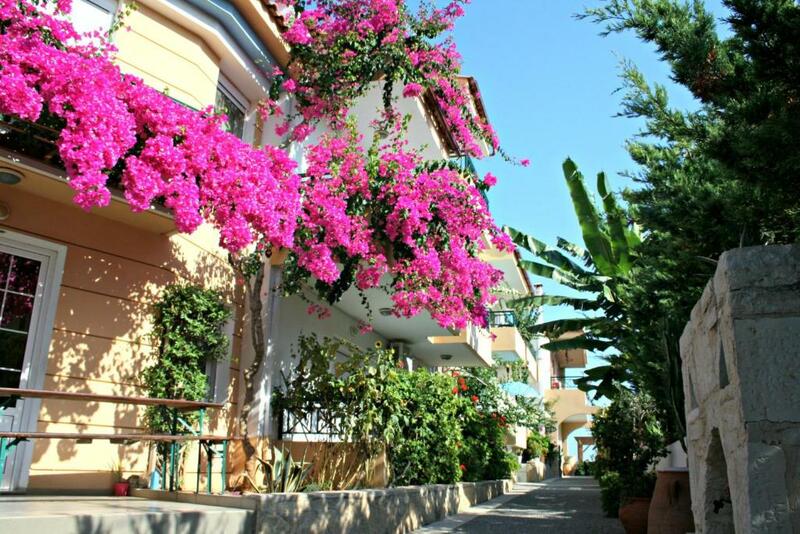 It offers studios and maisonettes with a balcony and patio, enjoying Cretan Sea views. Free WiFi is available in all areas. The self-catering units include air conditioning and a seating area with a satellite, flat-screen TV. They also have a kitchenette with a fridge and cooking rings, and a bathroom. Various restaurants and bars can be found within walking distance of Minoica Beach Apartments. The port lies approximately 6.2 mi away, in Heraklion City. The reception can help guests with car rentals, while free private parking is possible on site. When would you like to stay at Minoica Beach Apartments? 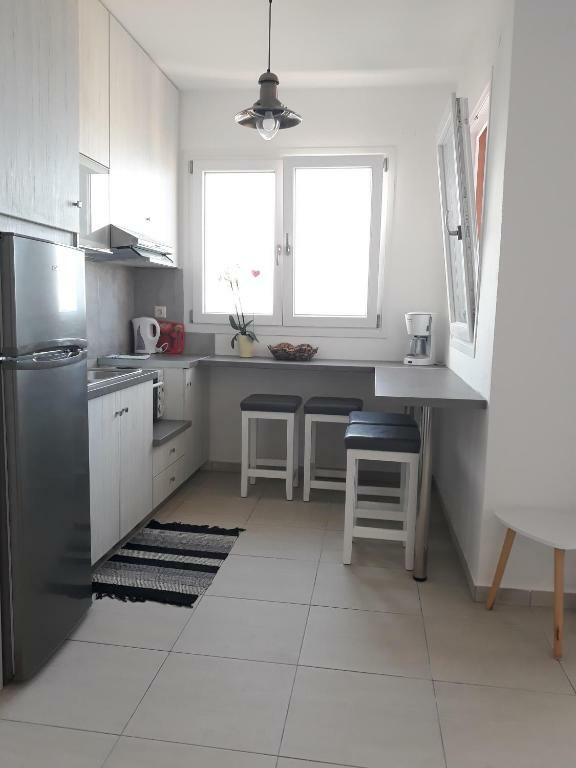 Opening to a balcony enjoying garden or Cretan Sea views, this studio includes a flat-screen TV, a kitchenette and a bathroom. - a kitchenette with a fridge and cooking rings. 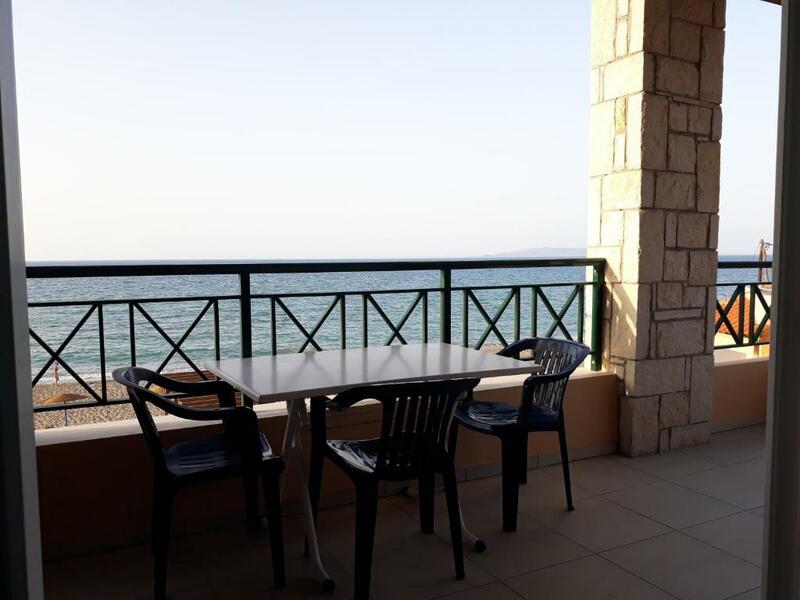 Opening to a balcony with Cretan Sea views, this air-conditioned apartment includes a flat-screen TV with satellite channels, bathroom and BBQ facilities. 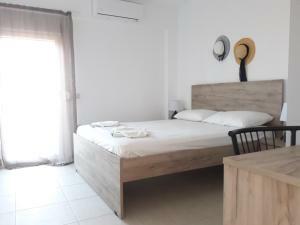 Opening to a furnished balcony with garden and Cretan Sea views, this air-conditioned studio includes a flat-screen TV with satellite channels, bathroom and BBQ facilities. This apartment has a kitchenware, toaster and soundproofing. House Rules Minoica Beach Apartments takes special requests – add in the next step! Minoica Beach Apartments accepts these cards and reserves the right to temporarily hold an amount prior to arrival. Please note that the remaining amount of the reservation can be provided by cash or credit card upon check-in. Please inform Minoica Beach Apartments of your expected arrival time in advance. You can use the Special Requests box when booking, or contact the property directly using the contact details in your confirmation. The building is tired and needs renovating.. Beds are not comfortable nor the lounge suite. Unfortunately it was very windy - not anybody's fault - so the sea was too treacherously 'wavy' for us oldies! Our room was a bit small and quite dark (Rooms above were probably lighter). A filter coffee maker but No kettle. No marks around the hot plate knobs to explain which way to turn them to increase or decrease the heat. The shower curtain was very hard plastic. I couldn't work the air conditioner ..... Should probably have asked our host. Not a very attractive walk to the shops. The host was very warm, welcoming and cheerful. The apartment was as requested, ground floor with sea view. In our room we found nearly everything we needed. A table (with tablecloth) and two chairs, a wardrobe, a desk, two single beds (excellent), two bedside tables each with a bedside light and a television with remote. The beds had clean white sheets, and we were each given a large and a small white towel. Additionally a white bath mat and two tea towels were provided. The 'kitchenette' had an undercounter fridge on the left with a drawer above it containing cutlery, utensils and 2 hot plates above. To the right was a sink with a bin cupboard below. Above was a cupboard with plates, glasses, carafe, bowls, and on top of the cupboard, a large and a small frying pan and a large saucepan. There was also a coffeemaker which we used to make tea. The apartment is just twenty paces to the beach! Loungers are provided which you can easily move to the beach. Also a handy tiled communal terrace with covered area and a barbecue! Outside our room, on our own tiny terrace we had another table and two chairs. ( shame it was too windy to sit outside) Pretty bougainvillea along the walkway. Bus stop to town and airport at the 'main' street with shops etc only about 250 meters away. I came here for the second time and it was (again) a great stay! The location, right next to the beach, is superb. The apartments, which were recently renovated, are really nice and clean and included, amongst others, AC, WiFi and good beds. And most importantly, Zacharias and Efi are great hosts who made my stay incredible. I would highly recommend this place to anyone who is looking for a relaxing place right next to the beach. Great price/quality ratio, nice hosts, cozy rooms. The best hosts ever! Effie and Zacharias! The appartements are great and the localisation is even better in real! Thank you for this wonderful holiday! Kind and helpful hosts. excellent location right next to the beach. Great sea view. Super clean and well equipped apartment. I would definetly come again. Bathroom was old-fashioned. Toaster and other accessoires in the kitchen were missing. Very pleasured stay. Very clean! Zacharias and Eve are very lovely and kind! Awesome view - next to the beach. Loved it!